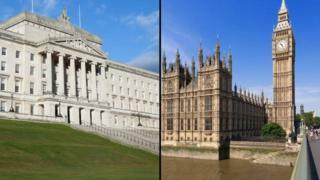 Northern Ireland’s main parties are expected to hold talks with the prime minister in Downing Street later. The DUP, Sinn Féin, the UUP, Alliance and the SDLP will hold separate meetings with Theresa May. She has already held talks with the DUP this week about a deal to support her minority Conservative government. Since last week’s general election, Mrs May has spent much of her time talking about Northern Ireland – and Thursday will be no different. Thursday’s talks will focus on attempts to restore devolution at Stormont by the end of this month. Secretary of State James Brokenshire has said there was very little time left to reach a deal before a 29 June deadline, but that local parties had it in their hands to take control of their future. While the Downing Street discussions will focus on restoring devolution, the prospect of a DUP-Conservative deal at Westminster will undoubtedly be raised, says BBC NI political correspondent Stephen Walker. The deal is now not expected to be announced before next week. DUP sources have told the BBC an announcement on a deal with Tories had been delayed because of the tragedy of the Grenfell Tower blaze. DUP leader Arlene Foster has returned to Northern Ireland after talks with the Prime Minister earlier this week, so her deputy, Nigel Dodds MP, was to lead the DUP delegation on Thursday. Sinn Féin MP Elisha McCallion said her party was very concerned about the Conservative government’s neutrality, as Theresa May and Arlene Foster were “two sides of the same coin”. Ms McCallion said she, Sinn Féin’s northern leader Michelle O’Neill, its president Gerry Adams and his deputy, Mary Lou McDonald, would tell the prime minister “very, very firmly” the details of the deal with the DUP needed to be “fully accountable and transparent”. She also confirmed that the seven Sinn Fein MPs, who were elected on an abstentionist ticket, would “absolutely not” be moving from that position. Meanwhile, Labour leader Jeremy Corbyn has demanded details of any Conservative-DUP deal, calling it a “nonsense situation”. “We want to know what is in the deal they are offering to the DUP and we want to know when it is going to be put before Parliament,” he said. On Wednesday, Mr Corbyn announced that Owen Smith would be his shadow secretary of state for Northern Ireland. It means Mrs May will remain as prime minister and the DUP MPs will be central to the survival of a Conservative Party administration. Devolved government in Northern Ireland broke down in January. The late deputy first minister, Martin McGuinness, stood down to protest the DUP’s handling of an energy scandal, in a move that triggered a snap election. The DUP and Conservatives were close to reaching agreement to enable Mrs May to form a minority government and the talks were not in trouble, according to DUP sources. But they added that the London tower block fire made an announcement on Wednesday “inappropriate”. The DUP source told BBC assistant political editor Norman Smith the two parties were now finalising the “terms and conditions” of an agreement after Mrs May and DUP leader Arlene Foster met on Tuesday.